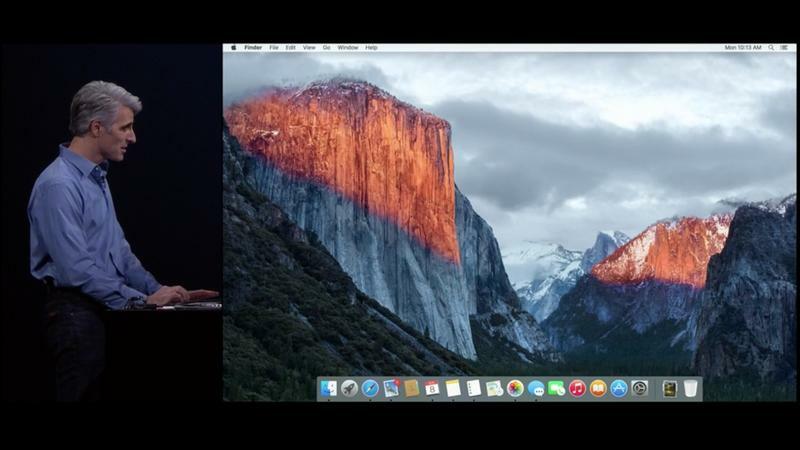 Apple just announced OS X 10.11, El Capitan, which is the successor to OS X 10.10 Yosemite that was introduced last year. Among other things, Apple says it focused on two main components for this year’s update: experience and performance. As the name suggests, El Capitan, OS X 10.11 isn’t a major update, but it introduces plenty of great new features designed to make the user experience better. Apple demonstrated a few of the new features onstage today, and although they can be considered small, they add up. For example, when you wake your computer, Apple is making is much easier to find your mouse cursor by making it bigger (it’ll get smaller once your computer completely wakes up). Next, Apple is adding some new features to Safari, like the ability to pin sites more easily, and the ability to mute or find audio playing in a tab just by clicking on a speaker icon in the address bar. Other browsers have been able to indicate what tab is playing audio, but this makes it super easy to mute that audio. Moving on to Spotlight, Apple is allowing users to resize the panel, which isn’t a huge deal, but gives users control over how their applications function and look. These are all features really aimed at power users. In Mail, for example, searching now works with natural language. Onstage, Apple type in “mail I’ve ignored from Phil,” and it brought up a bunch of search results. Apple pretty much barreled through the different features coming to the update. In addition to the ones mentioned above, there’s also better widow management, a tabbed compose in Mail, the ability to auto-arrange windows (a lot like what’s available in Windows), and faster performance; Apple says apps launch 1.4x faster than last year’s update. Next, Epic Games hopped on stage next to demo Metal on the Mac, where the developer said Apple’s new tech makes game development better and easier. The first beta is coming this July, while the upgrade, which will be free as usual, is coming this fall.